Treasure Lake has numerous options for all sorts of events. Weddings, parties, conferences and reunions. The Lakeview Lodge & Conference Center is a multi-purpose facility that is a centerpiece of social activity at Treasure Lake. Visitors often see friends and family at the Lakeview and will enjoy a beautiful view of the glistening waters of Treasure Lake. Book your wedding reception at the area’s largest and most enchanting outdoor wedding and lakefront wedding venue; your special day is sure to be memorable! With seating available for up to 400 guests and a variety of wedding and catering packages and a skilled and creative staff who will listen to your thoughts and accommodate your requests, you will not find a better wedding venue in the area to make your day fantastic. For more information or to schedule a tour of Lakeview Lodge, please contact the TLPOA office at 814-371-0711 ext. 903 or via email at events@tlpoa.us. The Lakeview Lodge is the perfect place to schedule your banquet, conference, Christmas party, baby shower, or special event. Seating is available for up to 400 people. You’ll enjoy a beautiful setting on the shoreline of picturesque Treasure Lake. All-inclusive banquet packages or full-service catering are available. For your business conference, we offer fully-equipped meeting rooms including wireless internet, LCD projectors and PA systems. For information about hosting your event at the Lakeview Lodge, please contact the TLPOA office at 814-371-0711 ext. 903 or via email at events@tlpoa.us. 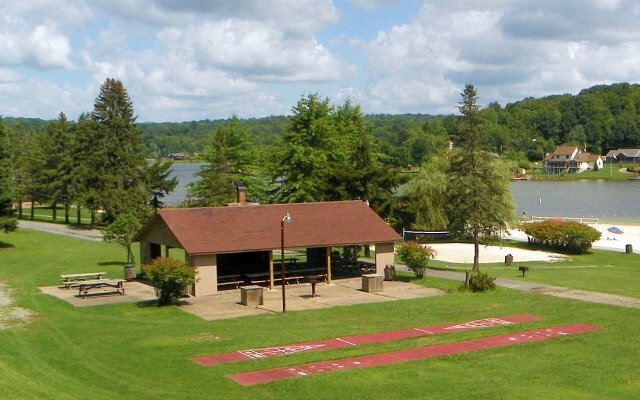 There are five pavilions in various locations within the confines of Treasure Lake: the KOA campground, at the Silver Golf course, at New Providence Beach, Little Flipper Lake and Captain Kidd Park. Each can be rented for your special event at a reasonable fee. Catering packages are available; see the section below. For information about renting one of our amenities for your event, please contact the TLPOA office at 814-371-0711 ext. 903 or via email at events@tlpoa.us. For more information about our Catering Packages, please contact the TLPOA office at 814-371-0711 ext. 903 or via email at events@tlpoa.us.